An amazing thing is happening right across the UK, more than 30,000 people every month are becoming animated and joyous – Why? – well. it’s all down to a team of 125 people who have an average age of 52years. This team really believe that (putting aside a few aches and pains) being more mature can be a huge advantage – just think about it – for a start, there are the countless life experiences. Every year broadens our knowledge, understanding and empathy. Stopping taking ourselves too seriously is priceless. Imagine all the things we might have dared do if we could have had this mind set years ago. Well these valuable qualities that can only be gained by experience might not count for much on a standard application form these days, yet to a tiny family run company these qualities are invaluable. If you and I are feeling a bit down, for whatever reason, we have the ability to perhaps put on a favourite piece of music, contact a friend, have a glass of wine, go for a walk etc. We have this ability and freedom to rebalance ourselves. We are all doing this on a daily basis without consciously thinking about it. Now think about elderly people in residential care, many of these people are (for a huge variety of reasons) no longer able to do this rebalancing adequately for themselves. Over 20 years ago David Grounds (then a professional musician) was researching ways of helping individuals rebalance speedily through the use of personally composed pieces of music. Although all this was staggeringly effective, it was very limited. David’s dream had been to help lots of people not just a few individuals. Around this time two things happened, David’s partner Helen became actively involved in the research and through a close relative they both became aware of how much the research could potentially help residents living in care. Now the research and trials became specific. David and Helen worked on every aspect that would enhance the Resident’s enjoyment and of course the all important rebalancing. Thousands of recordings were listened to, looking for the vital ingredients. A) Would it help with rebalancing? B) The quality on all levels of the recording. C) The emotion the piece evokes. When a piece of music was able to tick all boxes, it would then be included into a workshop structure. The next stage for the piece would be in the studio, as it may need to be adapted for purpose. Many residents can be hard of hearing in varying degrees. Many low sound levels are enhanced skilfully without compromising the piece or song. The research had also really highlighted the fact that three minutes was a magical concentration time, so most pieces were crafted into appropriate lengths, while still keeping the integrity and soul of the piece. 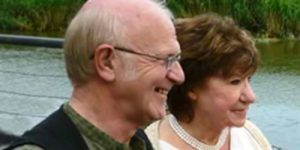 Almost exactly twelve years ago, the first workshop with real residents took place, though Helen and David had done countless trial workshops with friends and colleagues, and knew on all level’s that it should work. They were totally bowled over by the results. Residents who had initially looked quite down and a bit detached, became animated and happy. One lady even got out of her wheelchair and started dancing. (it had been over a year since she had done so of her own volition). After this day the wonderful carers at this home kept the momentum going and this lady continued going down to lunch using a walker. At the end of the first workshop, the manager of the home said “What do you do for an encore. Walk on water” – the power of music is magical and life enhancing. After more incredible feedback, most of the homes involved were telling colleagues in other homes about the miraculous workshops and the word spread far and wide. David and Helen thought the workshops should be named ‘Music for Health’. Six months later after being overwhelmed by requests for workshops, David and Helen started the search for like minded people that they could train to present the workshops. This is when they realised that they were looking for all the qualities of experience rather than paper qualifications. They needed lovely know at the end of every working day they had really made a difference to lives of others. 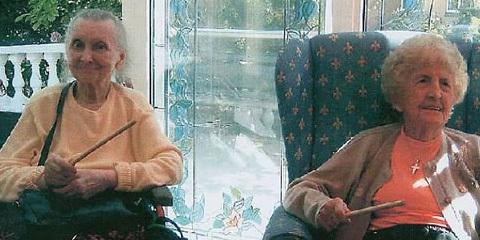 All the ‘Music for Health’ team become very fond of the Residents they work with, seeing them on a regular basis they become like family, so when one of them passes away it can be a very sad time, but it is also a time that the other Residents in the home urgently need the rebalancing of the workshop. A special workshop has been designed for times of extra stress. The workshops don’t just work for the Residents, they work for the team. Whatever life is throwing at them, everything is always more in perspective after a workshop. Team members who leave usually, if it’s possible, want to come back because they miss how rewarding and uplifting it is. Last year three such people re-joined the ‘Music for Health’ team. One couple had moved abroad and the wife, Louise, felt that coming back to England and onto the ‘Music for Health’ team had actually saved her life. Do see for yourself what’s going on at www.musicforhealthltd.co.uk Also if you are involved with a residential home that you think may benefit, do look at the interactive map to find your nearest workshop leader, who will arrange to come along to the residential home for an hour long interactive session, completely free of charge. This will enable everyone involved to experience at first hand the magic of ‘Music for Health’ in action.